Peter Bradshaw was on hand to represent old media (no disrespect in that term - by old we mean established, not nearly dead, and it doesn't come more established than The Guardian). Nick James had a slightly different perspective as Sight & Sound's editor along with Hannah McGill, film critic and director of the Edinburgh Film Festival and Sam Nichols from Momentum Pictures. Four of the Londonist team popped along as our Saturday Cinema Summary gives us a nice perspective on the whole online v offline debate, or at least we like to think it does. Also we often dabble in full on reviews ourselves as well as loving up certain projects before they are much more than a glint in the film maker's eye (Sunshine, Watchmen, etc). A handful of film bloggers, industry types and interested onlookers made up the rest of the audience. In the end it was very entertaining (if a little frustrating) evening. Thankfully the old 'who's better, us or them?' argument was mostly sidestepped, but there seemed to be an urge to find a consensus on whether or not the new school of film blogging, in all it's diverse forms, signaled a death knell for the print form. But the conversation is simply too wide and varied to ever arrive at such a simple conclusion. Today, for example, we learned that Premiere will cease to exist as a print magazine. Interesting as that is, we doubt it's the beginning of a slide towards death for the more recognised forms of film criticism. With the recent rise of publications like Little White Lies which rethink the concept of the film magazine and continued interest in more specialist mags like Video Watchdog there will always be a place for content you can physically hold (a suspicion confirmed by Nick James when he stated his wish to see Sight & Sound become the 'vinyl' to the blogosphere's 'iPod'). Not everyone is going to adapt well to the demands of an online savvy readership, but as long as papers like The Guardian continue to experiment with blogging and others at the very least archive their work online, we can't see why both old and new media can't work well together. The end result is simply more choice for the readers, which has to be a good thing. One thing that came out of the discussion last night (aside from how graceful Bradders is regarding our weekly review of his and his colleagues' work) was the obvious freedom bloggers have regarding space and time. If Nick James decides to mention the debate in his next editorial we won't see it for a few weeks. We, however, can wax lyrical about it right now - or even last night if we hadn't spent so long in the bar. It was announced last night that BAFTA would be producing a podcast of the event that will be online in several weeks time. Now while we didn't see anyone liveblogging the event, we did notice remarks were being Twittered instantaneously from a few mobile phones. So perhaps the easiest thing the old guard can do is spend a little more time online to learn exactly what it is that the kids are up to. You won't get a level playing field if we're not playing the same game. What we found frustrating was that both members of the panel and the audience had an incredibly unsophisticated knowledge of blogging and online journalism. More than once online writing seemed to conjure up an image of lonely spotty teenage fanboys, wanking in bad grammar about the movie they had just seen, in between whining posts about how misunderstood they are. Of course print journalists also have their publication behind them, so more people will perhaps trust the views expressed by someone in the broadsheets than an online blogger who uses too many exclamation points (omg lol!). The really worrying thing is just how lopsided the view of online film criticism is. Ain't It Cool was thrown around a lot last night, but that hasn't been a really relevant resource since the last attack of George Lucas vomit was mopped up. Recently it's blogs such as Twitch and London's own Solace in Cinema that have shown the way. Distributors love that word of mouth now has a much more sustained build up, as fans blog about everything from the poster, the set design and the casting months before they have ever seen the film in question. Blogging is so much more developed, and richer, and sophisticated than traditional media give it credit for. There are communities out there (note "communities" rather than isolated, socially retarded freaks with broadband) with as much discipline and editorial rigour as any established print journal. Editorial rigour is, in fact, even more keenly followed in online publishing because of the speed and the means available for writers, readers and editors to respond to one another: if an article is released with incorrect information or highly contentious material, it can be a matter of minutes to react and amend. This is a luxury, a privilege and an advantage that print journalism and publishing does not have, and we are keen to emphasise that online journalism and publishing is the better medium at this present time for editorial discipline. Rather than the unbridled, anarchic, grammatically incorrect writing that is so widely presumed when blogging is considered, there are many out there striving to emulate and even exceed the disciplines and ethics of print journalism. And vica versa? Are we going to see Philip French blogging about the artwork for Black Snake Moan anytime soon? We doubt it. But that's not to say that more highbrow bloggers such as Steven Shaviro can't easily give Sight & Sound a run for their money. And, who knows, maybe by the time we get around to attending another of these events a British film blogger will have risen to such prominence as to have earned themselves a place on the panel? Right now though, the constant sneering about the poor quality of writing on blogs and their unchecked, unedited, unsolicited critical efforts make it clear that until there is a better understanding of what blogs are like right now, the debate cannot proceed. There will always be fear and trepidation about online journalism as long as there is ignorance about it. So, more events like this one please. There's something similar happening on Friday at the ICA with Gia Milinovich which is sure to be just as stimulating. * Film blogging and conventional film reviewing is like 'making biscuits for your friends or selling the best biscuits in the world for everyone'. * Peter Bradshaw definitely 'gets it'. So what do you think? If you were there last night please drop us a comment. And if you know of any great film blogs and websites that we should be looking at then please let us know either below or via Londonist (AT) gmail (DOT) com. The Guardian's film blog is also covering the subject. 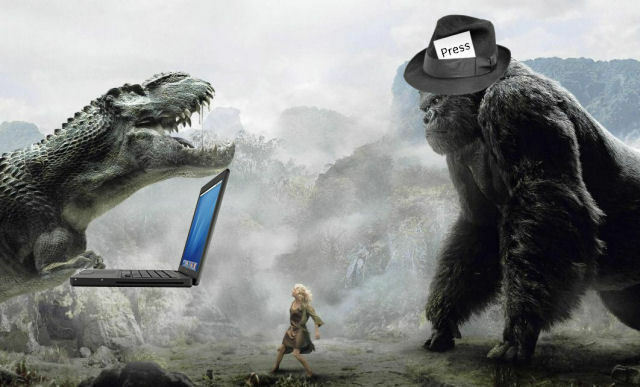 Note: We know a dinosaur isn't the best role model for blogging but his tiny little hands fitted the keyboard better while print journalists really are that grumpy.